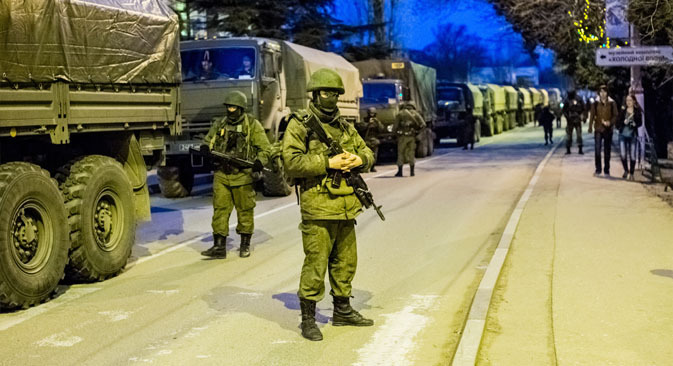 Is the authorization from the Russian authorities for use of force in Ukraine a precursor to actual troop deployments, or just a threat meant to lead to talks? The Federation Council, the upper house of Russia’s parliament, has authorized President Vladimir Putin to send troops to Ukraine, but should Putin decide to do so, the repercussions would be widely felt both domestically and abroad. Gleb Pavlovsky, head of the Effective Policy Foundation, said that Putin asked for the authorization as a way to send a message to Ukraine and Western countries, and he has no intention of sending troops. However, Pavlovsky noted that the situation could change any minute. “Any street brawl may be interpreted as a threat to the Russian Black Sea Fleet,” Pavlovsky said. Konstantin Kalachev, head of the Political Expert Group, also thinks the authorization was meant as a warning to the leadership in Kiev. “Moving forward, a lot will depend on the current leadership in Ukraine, on whether they will get Russia's message or decide to further exacerbate the tension. The message is: we have no intention of being passive onlookers. But this does not mean that the Russian leadership is ready to cross the red line. The Federation Council ruling should be seen as a prompt to serious talks,” Kalachev said. Russian foreign policy experts are certain that sending in troops would be detrimental to Russia’s standing in the international community, however, they also think that Putin will not make a decision based on the opinion of foreign leaders. “A considerable part of the international community would have an extremely negative reaction to Russia deciding to send its troops to Ukraine. But in this situation the head of state would have to be guided by national interests and values,” Alexei Chesnakov, head of the Center for Political Conjuncture, said. He added that any Russian troops would be a target for pro-Western Ukraizeta.runians. “Finding themselves on Ukrainian territory, where there is currently no state control in place, the Russian troops would become a ball that various forces will start to kick. Unidentified paramilitaries pelting Russian servicemen with Molotov cocktails risk nothing,” Pavlovsky said. Konstantin Kalachev said that the Russian reaction would depend on the troops’ mandate. “If they are used just to control infrastructure facilities and ensure law and order, it is one story. If, as a result of acts of provocations, there are casualties on either side, it is a completely different story. In Crimea, Russian troops may be welcomed, whereas in other regions, including Kharkiv, the situation is not that clear-cut,” said Kalachev. First published in Russian at Gazeta.ru.